SEIKO's Spanish <> English language tool, the TR2250 includes over 800,000 translations and features auto-language recognition. The unit’s Advanced Verb Conjugation displays different verb forms. Allows user to preset the conversion rate for quick and easy conversions between any two currencies. 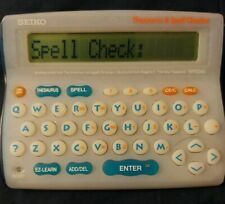 Seiko Instruments Spell Checker, Thesaurus, Calculator & Crossword Solver WP2260. Condition is Used. Shipped with USPS First Class Package. Ok condition! Very rare piece! 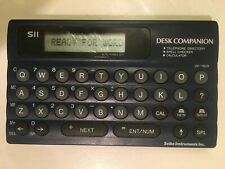 NEW In BOX Seiko Instruments SII POCKET ELECTRONIC SPELL CHECKER WP-1000 Case. Condition is New. Shipped with USPS First Class Package. This Seiko SR-T7000 is in great working condition.Operates on 2 AAA batteries. Fully functional. Good used condition with only minor wear. Convenient "10 Key" Calculator Keypad. Works great. I used this only a few weeks to help my husband in apple harvest on our farm one season. What's in the pictures is the actual item you'll get. It is in the original box with manual. I do not believe this has ever been used. The box has wear from storage. Packaging is very flimsy and has some minor wear and some thin cracks. In good condition. Tested and works. 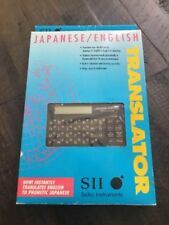 Seiko Multi Power 4 Handheld Telephone Directory Spell Checker Thesaurus Calculator Please view all pics and condition description. Selling the pen, case, paperwork, cable and retail box. No cd or software included. 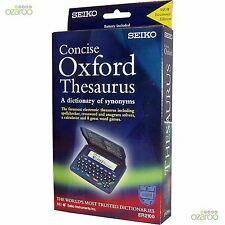 Words from"Roget's II: The New Thesaurus". 75,000 word high--speed spell checker. 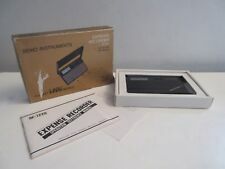 Included are: Dictionary with manuals, in original SEIKO box. box may show signs of wear due to age . This compact, four-in-one tool is powerful enough for your desk yet its small for your briefcase, pocket or purse. Crossword Puzzle Solver. Features over 80,000 words. Battery is still working though it may eventually need to be replaced due to age. See pictures for details. 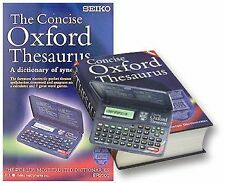 Seiko Instruments SII WP-5401 Handheld American Heritage Dictionary Personal. Condition is Used. Tested working! Corrosion free battery compartment. Requires 2 ‘CR2025’ batteries. Batteries not included. Works perfect and in good condition! Pen is like new no scratches. Tested and works great. Please take a look at all pictures to determine condition for yourself before deciding to make a purchase. Thanks for looking! Seiko Dictionary SR T6500 w/New Batteries. See Photos. English / French translation. The batteries corroded in the unit so I have not tested and it will be sold as-is. 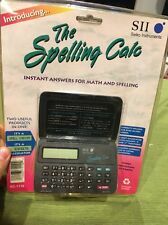 NIB Seiko SC-1110 The Spelling Calc ~ Math / Spell Checker & Calculator. Condition is New. Shipped with USPS Priority Mail. This item has been fully tested and works 100%! See pictures for exact condition! 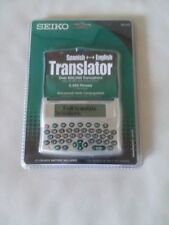 Seiko Instruments Electronic Translator TR-2701 Spanish English SII. Condition is Used. Shipped with USPS First Class Package. This item is sold as-is and it includes NO batteries! If you have any questions please feel free to message me! 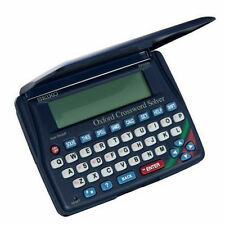 NOS Seiko UX-2000 Multi-Power 4 Spell Check Thesaurus Directory Calculator SII. Condition is New. Shipped with USPS First Class Package. Free Shipping! As pictured with case and manual! just lik en ew. SEIKO ET2240 SPANISH ENGLISH TRANSLATOR MADE IN JAPAN Tested EUC. Tested, great condition. Sold as is. Batteries not included. Included with this listing is everything shown in the pictures. Please carefully review the photos. Please ask any and all questions prior to purchasing on the item. I am here to help. Factory sealed in original packaging. Excellent condition. New old stock item from 1983. 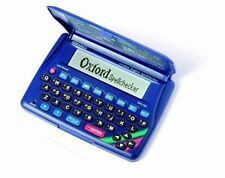 SEIKO SR-E6000 Japanese English Electronic Dictionary. Used, but in good condition. Tested, and in perfect working order. Couple noticeable scratches on unit. (SEE PICTURES). The face is mostly clean, all of the illumination works, and the buttons function as they're supposed to.